For this album, Joseph Vargo and William Piotrowski are joined by designer/photographer Christine Filipak, Eric Gustafson and the Gregorian Shadow Choir, and two other guest performers (who I’ll name later) to provide vocals. “Vigil” uses the sounds of wind and bells to create a lonely mood that ushers in the intro narration about a ghostly knight by Joseph Vargo. “Ghosts of Christmas Past” is both eerie and Christmasy, thanks to its tolling bells, heavy piano and vocals. Just as the title suggests, the music has the feel of recalling the past. “Ebonshire” is named for the fictional forest setting of the album. It’s much less spooky than the last song…for introduction, anyway. The vocals and string work give it an old and dreamy feel. The dark opening piano of “Solitude” reflects the mood suggested by the track’s title. In contrast, the light opening notes and vocals “Crystal Forest” set a much lighter tone for this. You could easily play this at a Christmas party without any looks of confusion over using “spooky” music. “First Snow” uses its opening somber string work to bring both falling flakes and drifting to mind. “Evening Star” is more (for lack of a better word) upbeat than most of prior tracks and has touch of reverence in the vocals. “Reflections of Long Ago” nicely use light plinking tune, like a music box, backed with wordless female vocals. “December Winds” begins with “olde timey” strings and gets darker, which is appropriate, given how such winds are harsh and chill you to the bone. “Phantom Toccata” is not the toccata you might expect, but it’s still a treat. “Hallowed Ruins” seamlessly flows from last track and has a sense of reverence or specialness in both the music and vocals. The male chanting of “Gregorian Hymn” can be beautiful or chilling, depending on your mood or P.O.V. “Spirit of the Season” uses light piano work that gets heavier as it goes on to create a somber work with beautiful touches. Coventry Carol is an old Christmas carol; a light, but still solemn song about the children slaughtered by the order of King Herod. Guest vocalist Jeff Endemann’s minstrel stylings reminds the listener that this is a song of remembrance, not celebration. Perhaps to make up for the tragedy brought up by the last song, “Lullaby” is much lighter and more cheerful. “Winter’s Knight” offers fantastic chanting by both sexes to create a somber, yet wonderous, mood. “Past Time with Good Company” is an English folk standard written by King Henry VIII! The guest vocalist for this song is none other than horror author Michelle Belanger. The string work is great here, as is the use of multiple singers. I especially loved the female solo in this. “God Rest Ye Merry, Gentlemen” is another old Christmas standard, this time presented as an instrumental (save for some wordless vocals). “Veni, Veni, Emannuel” is simply amazing. Mere words cannot describe it. Hopefully “Redemption” refers to that of the titular winter’s knight. Its use of a harpsichord is extremely soothing and relaxing, to the point where an unwary listener might find themselves dozing off. Nox Arcana’s take on “Carol of the Bells” starts slowly, then gets very festive and is not creepy at all (despite the use of chanting instead of lyrics). If you wait long enough after this ends, you’ll hear a secret track. You’ll know when it starts as soon as you hear the wind and light plinking music (I won’t spoil the rest). As is the case with all releases by the band, the CD’s liner notes are beautifully illustrated (this time designed to resembled a medieval illuminated manuscript). The notes also contain a puzzle, which seems to require a knowledge of Latin to solve. 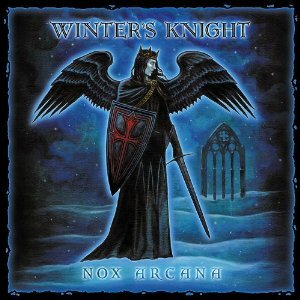 Winter’s Knight itself is an interesting mix of spooky, somber and “standard” Christmas music. Depending on the people who attend your next holiday party, you might want to mix a few select tracks in with other holiday tunes rather than play the entire album. Then again, it managed to get up to #8 on the Billboard chart for Top Holiday Albums, so maybe it’s more accessible to general audiences than I thought. Its success also led to a sequel, 2009’s Winter’s Eve (which I will review in my next article). Although Ms. Belanger did not return for that, she did team up with the band again for 2006’s Blood of Angels That same year, Mr. Endemann provided guitar work on a secret track in Carnival of Lost Souls and later went on to appear in Winter’s Eve.